I am in Seattle right now, sitting on the couch at Susan Jones's house, breathing in the fumes of lemon spice herbal tea. It's delicious. As some of you know, each of my business cards since 2010 has a fun fact. 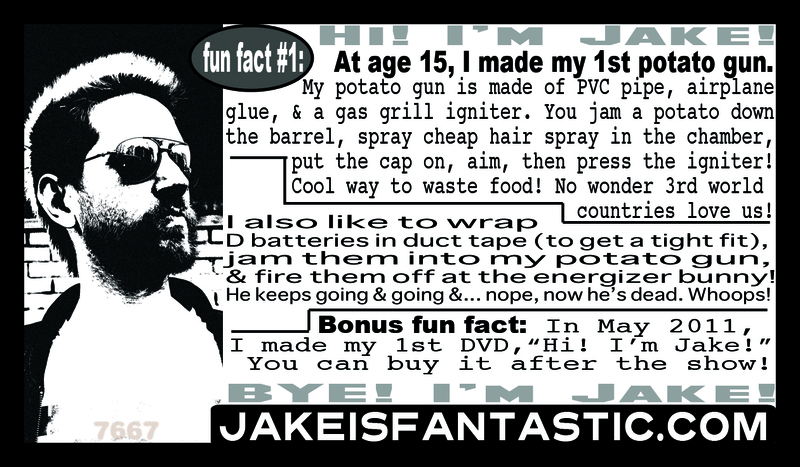 So far, I have 15 different fun facts, each 1 associated with a different business card design. The 1st fun fact I printed was actually fun fact #5. I wanted to show that my fun facts had history. Success! Now that I have done a bunch of these fun facts, though, I no longer need to do that. So, here is the most recent fun fact, fun fact #1 (I am going back and filling in all the numbers I skipped). Enjoy! put the cap on, aim, then press the igniter! & fire them off at the energizer bunny! He keeps going & going &... nope, now he’s dead. Whoops! I usually hand my business cards out after my shows to the people who tell me they liked my set. 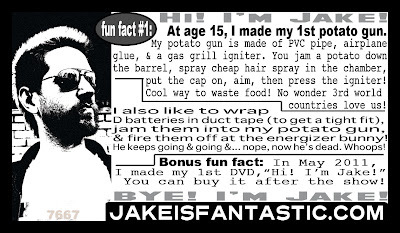 I'm hoping they check out my website, http://jakeisfantastic.com and come to another show in the future. Fun fact #1 is the only batch of cards so far that is black and white. I made them black and white to save costs. At Kinko's the price more than doubles if you do color. Normally I print these business cards at http://gotprint.com . However, I ran out of business cards and I'm at Harvey's in Portland this week. I need to make sure I get people to come back next time I'm in town, so it's especially important I have something to hand out. So, I printed a limited batch of fun fact #1 my cards at Kinko's. Printing my cards at Kinko's took forever! The lady ahead of me had some issue with her coupon or discount or something so it took 25 minutes before they could get to my stuff. While I waited, I farted a bunch. I had eaten eggs today. Egg farts are pretty bad. Kinko's was really warm, too. A loving couple smelled my fart and swiftly walked past me. When I finally got my cards printed, I still had to spend 90 minutes cutting them. Yay! I'm a cutter! Well, I'm watching a movie and eating some nuts right now. I can't just talk about a business card all day now, friend!